Now that I’ve gotten all of my sarcasm out, we can focus on the task at hand, the world of Tython. Starting World/Origin World/Homeworld, take your pick at which term you prefer. Tython is the first world you encounter in your adventures as a Jedi Consular or Jedi Knight. While it wouldn’t have been my first choice for a Jedi starting area, BioWare did a fantastic job with the questlines and the rendering planet it’s self. Personally, I’ve played through Tython four times already, once with my daughter, and three times on my own. Don’t get me wrong and think that I’m a tree-hugging, hippy, Jedi. My main is Sith. I find Tython to be one of the better rendered environments within a video game that I’ve encountered. Tython is simply stunning. Tython is a planet located in the Deep Core Regions of the galaxy. With the Star Wars Galaxy being a spiral galaxy much like our own Milky Way Galaxy, this would put Tython in the center area, where the stars are densely packed and the glow from these stars is very bright. This region is also very unstable due to the fluctuations in gravity caused by the dense clusters of stars and their effects on each other. Traveling galactic south from Coruscant, on a map, you’ll find Tython. It’s a planet of mountains and forests, teeming with life. Perfect for the living-loving Force-users. The world of Tython is as rich in Force lore (no pun intended) as any other planet. It can be called the birthplace of the Jedi Order. Not only would the Jedi begin their formation on Tython, but the basis for the Jedi Code as it stood throughout the days of the Republic can be traced back to this world. Tython can be said to be the birthplace of modern Lightsabers also. With that being said, we could also say that Tython is the birthplace of the Dark Side of the Force, or at least the first true appearance of Dark Jedi/Force-users in the known galaxy that would become the Republic. Please note that I’m not figuring in the Rakata or the Sith into this. Before the formation of the Galactic Republic, the world of Tython became the chosen center for study of the Force. 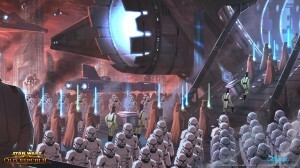 In 36,453 BBY, scholars, philosophers, scientists, and some of the other brightest minds in the galaxy converged on Tython to form a society based around the study and practice of Ashla, or what would later become known as the Light Side of the Force. Some time after this group’s founding, the practice of Bogan, the Dark Side of the Force, began to form also. Bogan came into being as more Force practitioners began to hunger for power and control. The Jedi Temple on Tython as seen in game. During the early days of Force-users, it was thought that using the Force was somewhat limited to Tython. This was disproved later as groups of Jedi ventured out into the galaxy and settled on other worlds. The Jedi would set up temples on other worlds in the coming centuries and millennia. Ossus, Coruscant, and Taris are some of these worlds. At some point in time, between the formation of the Jedi Order and the Galactic Republic, hyperspace travel to and from Tython became hazardous as gravity shifts in the Deep Core region disrupted known hyperspace lanes. At this time, the Jedi abandoned Tython and spread throughout the known galaxy. They would eventually organize on Ossus, where a Jedi library and academy was built. After the near-destruction of Ossus during the Old Sith War, the Jedi would relocate to Coruscant and the Jedi Temple there. It was after the Sacking of Coruscant and the destruction of the Jedi Temple during the Great Galactic War, around 3653 BBY, that sparked a renewed interest in Tython. Jedi Master Satele Shan, who may have been Grand Master of the Order at this time, knowing the route to the nearly forgotten world, suggested the move of the Jedi Order back to Tython. All knowledge of Tython had disappeared over the years, except for information in the Jedi Archives. On Tython, the Jedi would be able to rebuild the Order and heal from 28 years of war with the Sith Empire. On Tython, the Jedi began studying their origins, while encountering the native species, the hostile Flesh Raiders. A Twi’lek colony also sprang up on Tython, although the Twi’lek settlers were viewed as illegal colonists by the Republic. The Jedi were not legally permitted to provide the same aid to the colony as they would the average Republic citizen because of this. The central quest hubs for Tython are: The Jedi Temple, complete with vendors and trainers, Kalikori Village, the Twi’lek settlement, and the camp outside the Ruins of Kaleth. The primary objectives of most of the quests is to rediscover lost history and artifacts of the Jedi, while aiding other padawans, assisting Twi’lek colonists from Flesh Raiders, and locating/defeating a dark presence that has taken shape on Tython. If I say too much on the quests, I might be putting out big spoilers for those of us who haven’t created a Jedi character yet. No Spoiler Alerts here. The culmination of the quests is creating your first Lightsaber, of course. This is done in the ancient structure known are The Forge. Ancient Jedi called it Vur Tepe, the temple built in an old volcano along the Tythos Ridge mountains. It’s said that the ancient Jedi created the Forge as a place where they could repair their weapons in peace. It’s also said that Lightsabers were first created at The Forge. While there are four public transportation hubs in the Tython zone, be prepared to walk/run. The zone is big, but not too big. Most quests chains are within easy distance of these hubs. Tython slipped out of use by the Jedi Order sometime between pre-3600 BBY and 2000 BBY, when the Jedi Council moved the order back to Coruscant and into the rebuilt Jedi Temple there. This could be because of deteriorating hyperspace routes or because the Jedi felt that Coruscant would suit the Order’s needs better. An exiled Jedi would make use of the planet later on, which would draw the attention of Darth Bane, the Sith Lord who instituted the Rule of Two, one master, one apprentice. After that, Tython just, well, faded from the galaxy. Later on, in the Expanded Universe novels, Tionne Solusar, the scholar of the New Jedi Order in the New Jedi Order era, makes reference to Tython. Whether this historic Jedi world will remain “lost” for future content in the Expanded Universe, outside of SWTOR, remains to be seen. The safe bet is that Tython will have more of a role to play in future content concerning the Jedi. Just because the Jedi are viewed as the “Good Guys”, doesn’t mean they have to be goody-two-shoes. As you play through Tython, you can see that there is lore that showed some darker sides of Jedi in the past. You always have the option of playing a “Dark Jedi,” even when you choose the Republic faction. If you haven’t yet, I recommend you to create a Jedi and go hack and slash your way through the wonderful world of Tython.